Jeff Sekerak - The Simple Body-Weight Workout: Good Call Mr. Lee. Wherever You May Be. The Simple Body-Weight Workout: Good Call Mr. Lee. Wherever You May Be. Bruce Lee claimed: "I fear NOT the man who has practiced 10,000 kicks once. But I fear the man who has practiced one kick 10,000 times." And I believe he was hinting at this idea: The man who practices simple, powerful techniques MANY times - like the karate kick of which he spoke - tends to be far more skilled, fit, and fearsome than the mere dabbler. Who may practice dozens of various moves daily. Think of it. When you get really good at even a simple movement, athletically-speaking? It becomes second nature. So much so that in order to execute it - you don't have to think about it at all. After sufficient practice you can implement a move quickly, effortlessly, and in an instant. Which in my experience, can make the difference between success and failure. Before, I became winded during workouts. I was now able to exercise for long stretches without tiring. Intense 60 to 120 minute workouts became no problem whatsoever. In fact: I reached a level of strength and cardiovascular fitness I'd once thought, 'completely ridiculous.' Hour-long sessions of 1000 squats, push-ups and crunches - a workout favored by Herschel Walker, Lee and others - became my norm. 1) Pick a PROVEN exercise plan - and stick to it! Yes, you can lift weights if you must. You can even use the occasional fitness 'gadget.' Yet I recommend simple sets of calisthenics - done one set after another, with no rest in between. Make THIS the core of your fitness plan for a while. As this method leaves ZERO doubt that you'll 'whip' yourself into the best shape of your life - and fast. Do as many push-ups as possible. Start by doing them on your knees if necessary. Then, with no rest at all, do as many crunches as you can. Again: No rest! Then do as many body-weight squats as you can. Simply keep the back straight, bend your knees until they're about parallel to the ground, and repeat. Then start again with push-ups. And repeat the entire cycle again. Do this for 30 to 40 minutes. Practice this daily. You'll turn yourself into a lean, mean 'fitness machine.' And you'll do it FAR sooner than you might think. Just make sure to eat clean in process. Fruits, veggies, beans and whole grains are your best bet. I've never had the overall strength and core-power I have now. And I haven't touched a weight in years. I do ONLY calisthenics. They're simple, sure. Yet each exercise activates every major muscle group in the body - unlike many machine or weight-based exercises. Which tend to focus on one body part at a time. And which do NOT engage your core and 'entire being' with each movement. 3) Give it all you've got! In other words: Give it your best with each workout. When doing a calisthenic session, Do NOT rest between sets. As that will compromise not only your level of fitness - but your mental focus and toughness as well. Don't settle for that. Demand your best, always. And you may soon have friends ask you: 'Hey! What's your secret to getting ripped!?' Its happened to me. Follow these simple ideas. You'll turn yourself into a physical 'specimen,' of which you can be proud. You'll build a body that garners unspoken respect from all you meet. You'll be in the shape of your life! All if you focus upon the simple - and exclude the unnecessarily elaborate. 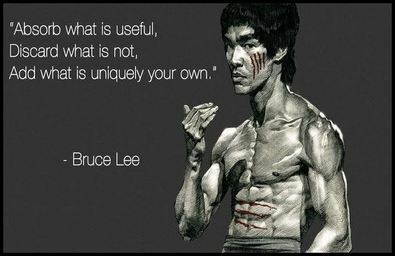 More: You'll make yourself a living example of Bruce Lee's idea: That complex 'masses' of techniques can't beat simple ones that stand the test of time. Like the simple body-weight workout. Or, metaphorically speaking: Like that one kick practiced 10,000 times. Good call Mr. Lee. Copyright 2015, J. Sekerak. All rights reserved. Consult your doctor before engaging in any diet or fitness program.